Christmas has been very kind to me! 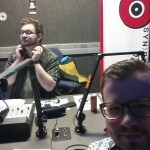 On air right now for Nick Mason’s last night on syn fm. 90.7fm Syn.org.au but apparently the steam could be down. Let me know if it’s working for you!